Even if you’re falling-down exhausted, I urge you to empty the sink, load the dishwasher, wipe the counters, and put out a fresh dish towel. There’s nothing worse than getting up in the morning and scrambling to find a clean coffee cup or an unused spoon for cereal. Take a few minutes to write out a to-do list for tomorrow. Don’t spend too much time on it, simply jot out the most important tasks and prioritize them by importance. As you may recall from my morning routine, I like to plan my day in the morning. However, my most productive days are when I jump-start my planning the night before. I want to add one more thing here… I’m learning the importance of allowing interruptions to happen in my life. So even though I take time to plan my days, I’m flexible with whatever happens. We can’t predict the sick child, the friend in need, or the call of God to spend more time with Him. While planning, it’s important to keep a realistic attitude. Even the best plans can go awry… and that’s okay! Think about what you do every single morning. Perhaps you exercise or you read the Bible. Think about how you can prepare for the next morning’s activities, tonight. Once you’ve considered this, I encourage you to make a few preparations for the following day. Do something that gives you joy. So you had a rough day. The kids fought, you lost a library book, your car broke down, and the dog puked on the carpet… again. Sure, you can go to bed and cry yourself to sleep but wouldn’t it be better to end your day on a high note? I believe that being reflective is an art that isn’t practiced enough nowadays. People so often rush from one thing to the next, they forget to pause and reflect on what’s happening in their lives. When taking a moment to reflect, it seems to lend itself with ease to being thankful. When I pause… I’m flooded with memories of the day. Some moments, I may not be too proud of, but I can briefly address what I would do differently if confronted with the situation again. I also like to write out at least 3-5 things I’m thankful for. This practice can make even the worst day bright again. Getting enough sleep has a huge impact on the next day! Make sure that you’re not staying up too late, and that you’re getting enough sleep every evening. A well-rested body often makes for a better day ahead. It may take some discipline to get to bed early enough but commit to it and you will surely see results. After reading this list you might not know where to start. I recommend picking the tip that resonated the most with you, and add it to your evening routine… tonight! Then, every day or two, add another tip into your schedule. Some of these suggestions came from the Make Over Your Evenings 14-Day course by Crystal Paine (from Money Saving Mom). My success in making changes to my evening routine, came from the inspirational videos, workbook, and supplemental resources in this program. With a commitment of just 15-20 minutes day, I was able to take my evening routine from unproductive, to inspired. There’s no time better than now to start making positive changes in your life. 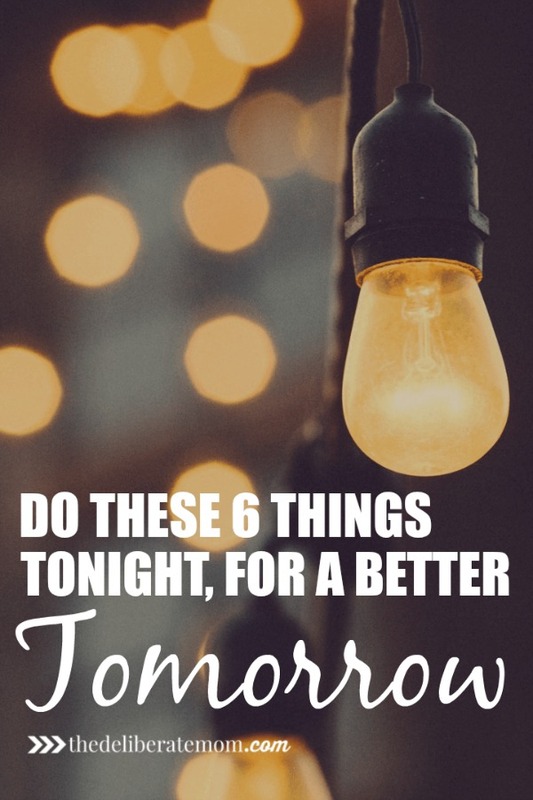 Have a better tomorrow… starting tonight! Sounds like you have some great evening practices Janine! I love my evening routine – it really does help the subsequent day. Well, you still have a little babe too – that can throw off bedtime consistency too. I had to train myself to go to bed earlier. I’m so much happier when I go to bed earlier too! These are so helpful and wonderful reminders. Trying to get these things ready for the following day are such time (and stress) savers! My biggest fail is getting something ready for dinner the next day. I’m doing better at getting that ready the night before but still need to make it a habit! :) Hope you have an amazing day! I’m delighted these suggestions resonated with you! It makes such a difference to plan a bit for the following day. Time and stress-savers for sure! And he takes baths. I tend to do everything the next morning when I’m rushed. Not cool! That’s awesome that Cassidy is like that. I find if I don’t do dishes before bed, I’m scrambling in the morning to “catch-up”. I hate that feeling of being behind. Four hours a night is brutal. Hopefully that passes soon – sleep deprivation can definitely knock our energy and motivation levels. Yes, we’re all a work in progress – half the battle is realizing that and accepting that change is hardly ever instantaneous. Move the meat from the freezer…so simple, yet I almost always forget LOL This is a perfect list. thank you so much for sharing! So glad you enjoyed this list Anne Marie! I agree with all your tips! My mornings are so much more productive and smooth when I prepare the night before, especially when i clean the sink out;) I love your idea of writing down what you are thankful for at the end of the day and being reflective. It really makes such an impact on tomorrow! I love preparing for the next day, the night before. It takes a few minutes but it has a huge impact the following day! Being reflective is so important to me… it really helps me hone in on what I need to do and what I need to pray over/for! Great tips! I try to do most of them on a regular basis, and I notice a big difference in my productivity, mood, and energy levels when I stick with a good routine. Thanks for the reminder. I’m delighted that this post resonated with you Michelle! Yes, sometimes we need that little reminder to change direction and do things a little differently. Yes, I find that doing a little bit of something I enjoy helps me sleep better. Keeping a thankful journal by my bed would help me write down what I’m grateful for. Taking time to reflect often reveals the silver linings that really are in the difficult moments. The make-it or break-it activity for me is remembering to start the dishwasher . . . it’s so loud I don’t like to do it before we head upstairs, but if I forget – finding it still dirty is a bad way to start the morning! Dirty dishes in the morning creates instant overwhelm for me. It’s the one task I absolutely MUST do before bed. I found your blog on the SHINE blog hop. I love this list! Last night I took the time to clean the kitchen before bed, and you’re so right; it made the morning just a bit brighter knowing that task wasn’t awaiting me when I woke up! Welcome to the SHINE Blog Hop Amy! I’m delighted that these tips resonated with you. It really DOES make a difference to spend a little bit of time doing these things before bed. This is truly a great post and everything you stated is true. From the minute I began reading it, I was like, “I need to get better at this.” I was surprised to see preparing your coffee pot on the list because that is something that I regularly do. I was raised to never leave dishes in the single. I would say 99% of the time this is done. If I mess up a cup or dish after washing dishes than it may stay there until the next day. I also used to iron all of my clothes for the week on Saturday mornings. Even if you are unsure on what you want to wear, at least you will have 5 or six outfits ready to go for those mornings when the unexpected arrived. I’m delighted this resonated with you Lowanda! It sounds like you have some important routines in place too! It really DOES make a difference to the following day, doesn’t it?! Yes to all of these! You know I love posts like this. Getting a good night’s sleep is soooo important for everything in your life. And I always go to sleep with a clean kitchen. I’m delighted you enjoyed this Tiffany and that it resonated with you. I’ve always known, I NEED a good night’s sleep… unfortunately, I used to have the bad habit of letting go of sleep when I have a lot to do. Not anymore! I’m far more productive and clear-headed when well rested. Looking forward to all the help I can get! :) Thanks! Yay! I hope this list helps you out Karin! I like to plan my day in the morning too though you’re right that mornings always go better if I do a little preplanning the night before. Stopping by from Mommy Monday and hope you’ll link up with us at Small Victories Sunday Linkup and Pretty Pintastic Party both going on now on my blog. Cleaning the kitchen at night makes a HUGE difference in how my day starts the next morning! It really was a game changer when I started doing that consistently. All of your other suggestions are great too and I really need to implement some of them! I hate waking up to a dirty kitchen, it makes me feel like I’m behind when I haven’t even started yet! Delicious tips from the Deliberate Mom. We’re often so tired that end-of-the-day work rolls over into tomorrow and compounds our fatigue. Pushing through to do these simple to-do’s can make life more manageable and enjoyable. Thank you for sharing at Tuned In Parents.